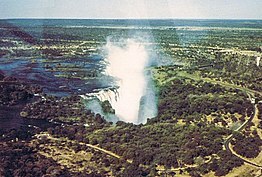 ^ a b c d e World Commission on Dams website: "Case Study ? 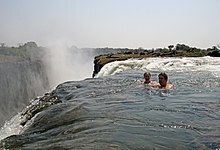 Kariba Dam-Zambezi River Basin" Annex 13 & 14 Victoria Falls Mean Monthly Flows. Website accessed 1 March 2007. This website gives mean monthly flow rates in cubic metres per second (i.e., the total volume of water passing in each calendar month divided by the number of seconds in the month), the standard measure used in hydrology to indicate seasonal variation in flow. 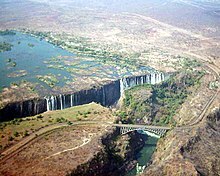 A figure of around 9,000 m3/s (318,000 cu ft) is quoted by many websites for Victoria Falls but this is the mean maximum instantaneous rate, which is only achieved for a little amount of days per year. The figure of 536 million m3/minute (18.9 billion cu ft/min) on some websites (eg ZNTB) is an error for 536 million litres/minute (equivalent to 9100 m3/s or 142 million U.S. gallons/min). The '10-year maximum' is the mean of the maximum monthly rate returned in a ten-year period.